It uses the WA camera interface to aim, but instead of taking a picture, it can kill the Sim in the scope. It supports long range rifles, so you can use the full zoom to snipe out distant targets. You need to install the WeaponsLib package plus the weapon object packages you would like to use. In the game, you can find the objects in buy mode under Entertainment / Hobbies & Skills. The Riffle costs 1600, the Pistol 499. Latest version requires base game patch level 1.38 or higher(tested till 1.47), and is compatible with base game and every expansion/stuff packs released to date. It works with base game only, although there are some effects that are only available with WA, Ambitions, Pets and Supernatural. If you have an old patch level, there are an older versions of this mod that work with base game version 1.8 and above. PM me with your current game version if you need an older version of this mod. Carry Weapon - Makes the Sim carry the weapon, so that it's ready to Shoot. Shoot - Allows you to aim and shoot a Sim. Depending on the weapon type used, you can have more or less zoom range. Killing Gallery - I decided to leave in the picture inventory from the camera object, in case you want to keep track of your kills. Clear Gallery - Clears the kill gallery. Each weapon has an associated damage, and depending on the precision of the shot and distance of the target, it will inflict more or less damage. The damage will be taken out of the Sim's energy (injuring him), or if the sim runs out of energy, he will die. Weapons can have piercing ability - a Long Range Rifle can kill up to 3 sims with one shot if you line them up right. Some weapons can use "knock out ammo", like tranquilizer darts, which will put the Sim to sleep rather than killing him (although an overdose of tranquilizer might eventually be deadly). Witnesses in the same room and near the shooter have a chance of calling the police, in which case you'll get arrested and loose your job (except if in a criminal career). The shooter, witnesses and victims will get mood/buffs effects (like Horrified, CreepedOut, FiendishlyDelighted, etc) depending if they have evil or good alignment. Vampires will only die with wooden ammo, mummies with fire weapons, simbots with electric weapons, werewolfs with silver bullets, etc. You can shoot some objects, producing several effects depending on the object type. If the Ambitions EP is installed, some objects might explode when shot with a powerful weapon or explosive ammo. Currently shootable objects: All Repairable or Cleanable objects (will get broken or dirty), Lights, Insects, Toys, Fireworks, Boulders and Gravestones/Urns. This can also be used with NRaas' Mobster career and Assassination skill, so you can have hitman jobs and assassination opportunities. Verified compatibility with patch 1.47 (no changes needed). Added Czech translation by Peccoskaify. Added Polish translation by cejanek. 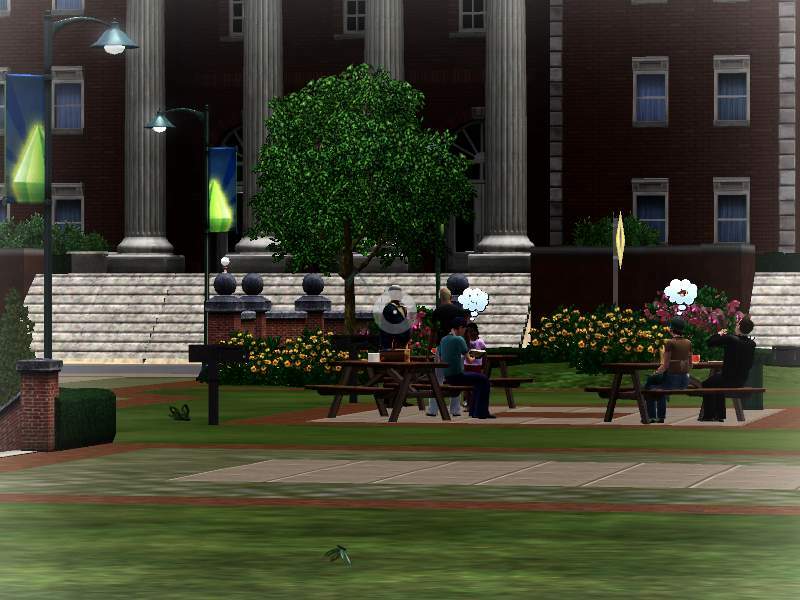 Fixed issue when shooting some Sims (tipically NPCs), that their energy wouldn't go down. Increased power of the pistol, to make it easier to kill sims with one shot. Updated to patch 1.42 (disabled shooting fireworks to keep compatible with 1.38/1.39). Added Chinese translation by mahamudo. Made werewolfs only die with silver bullets (added to pistol). 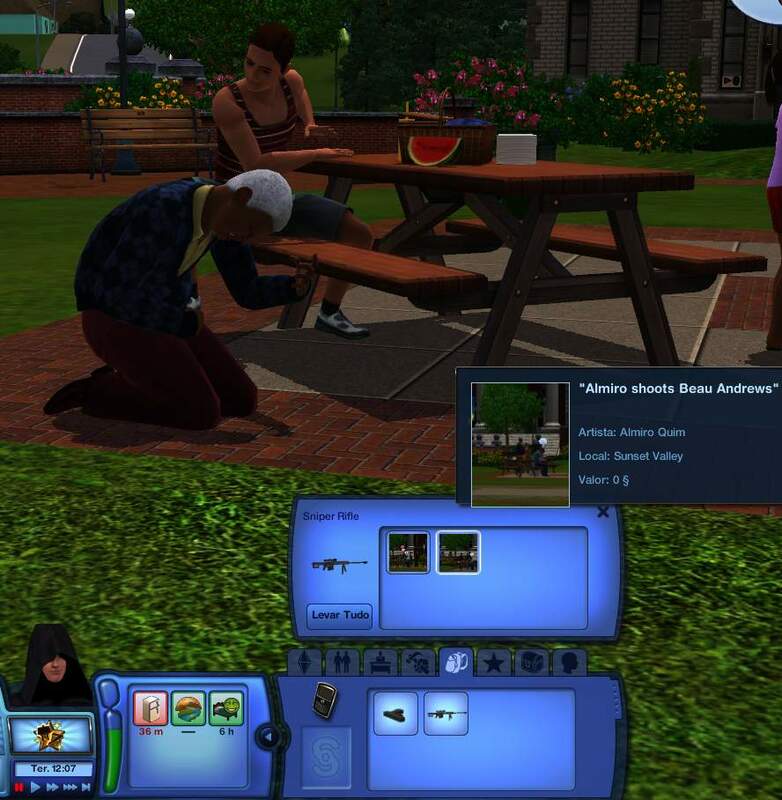 Modified witness system so that witnesses won't call the police when killing supernatural sims. Misc adjustments and bug fixes. Updated Swedish translation by XOO7. Quick fix for patch 1.38. Updated for patch 1.26 / Pets - Time to hunt down some animals! Made vampires only die with wooden ammo (crossbow weapon coming soon eventually), mummies only with fire weapons (like the phaser), simbots only with electric weapons. Added explosion effects (if Ambitions EP is installed), when some objects are shot with a powerful weapon or explosive ammo (added explosive ammo option to the rifle). Before removing or updating the mod, sell all weapons your sims might be carrying in inventory and save the game. I have structured the object script code in a separate package file (WeaponsLib), so that if anyone would like to make additional weapon objects meshes, they would just need to set the object script field to one of the weapons available in the lib package, and it would automatically adopt the behaviour of the selected weapon. Ammo Type - Similar with the regular ammo type interaction, only all possible types would be available (e.g. arrows to kill vampires). 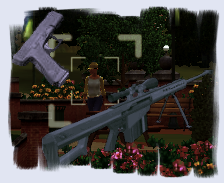 Weapon Type - Allows changing the type of weapon being used, affects mostly the type of death inflicted on the sims. Set Debug Mode On/Off - Toggles the display of debug messages. Carry Model (only with debug mode on) - Changes the way the weapon is carried, useful only for object creators to define the weapon position in the sim's hand. These interactions are NOT available when the weapon is in the inventory! The weapon needs to be on a surface or being carried on the sim's hand. All other language resources are in English. If anyone would like to translate into other languages, let me know, and I'd be happy to include it. Special thanks to XanKriegor for the great weapons meshes, and to ChaosMage, Ani and Kolipoki for unveiling the possibilities of object Modding.